The wild world of bicycle collecting, as with all collecting, there is a group of people that are the sellers. Sure there are tons of people that sell items, but their is a dedicated group of collectors out there that make a living finding and selling rare and outdated parts. That group is usually small and everyone knows each other and know what they have and are usually envious of the next guy’s pile of stuff. It is the classic case that the grass is always greener on the other side. We are in that group of sellers. 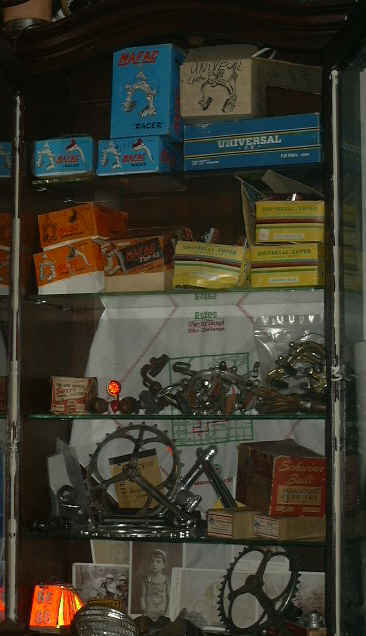 We travel anywhere and everywhere trying to find the newest undiscovered cache of parts/bicycles. We love swapping stories with other sellers the tales of the elusive basement find of new old stock parts, or the gem of a barn fresh unrestored classic. It seemed years ago, the stories were more abundant. That is not to say cool things are not showing up, being discovered, because they are. It is that we must chase down every lead and travel a lot further to come across the parts. Sellers are a big part of the collecting world as we are the ones that make it possible for restorations to get completed. From simple things as locating brakes and hardware, to doing the research in our vast inventory of catalogs to accurately help collectors complete their projects. Sellers are usually collectors as well and use selling of duplicate or unwanted parts/bicycles to fund bikes they want in their collection. We have some super awesome bicycles in our collection and that is only possible by selling off ones that we no longer want. I love being able to facilitate a restoration- for someone to ask me for some part they thought they would never find, and we happen to have it. Nothing is more rewarding than that as a seller of rare parts.